We’d love your help. Let us know what’s wrong with this preview of Prague in Danger by Peter Demetz. During the years 1939-1945, Peter Demetz was living in Prague - as a 'first-degree half-Jew' according to the Nazis - and he joins an objective chronicle of the city under Nazi occupation to his personal memories of that tormented, tragic period. To ask other readers questions about Prague in Danger, please sign up. Decently written, informative account of the Nazi occupation of Prague during WWII. Demetz includes personal accounts (he was there, a teenage half-Jew) as well as literary-historical accounts (this is his academic focus as a prof in the States). Both are insightful and fun to read, but both seem a bit on the apocryphal side and some of his efforts to mix teenage whimsy and sexual awkwardness into his personal story seem strained, overly self-conscious, and ultimately superfluous. After reading Decently written, informative account of the Nazi occupation of Prague during WWII. Demetz includes personal accounts (he was there, a teenage half-Jew) as well as literary-historical accounts (this is his academic focus as a prof in the States). Both are insightful and fun to read, but both seem a bit on the apocryphal side and some of his efforts to mix teenage whimsy and sexual awkwardness into his personal story seem strained, overly self-conscious, and ultimately superfluous. After reading so much Kundera also, I wonder if there's a 'thing' about Czech males of this generation? Anyway, I found his deeply erudite and well-researched discussions of the contemporary musical, poetic and literary movements and figures really fascinating; I am always interested to see how folks navigate these exceedingly difficult social and political circumstances artistically. There was mention of two until-recently-obscure composers (both killed in camps) whose music I have played and who have been the focus of study by former teachers of mine. Nice to see them getting this kind of attention. Alexander Zemlinsky (R. Strauss-esque operas) and Erwin Schulhoff (socialist-realist symphonic) are both worth checking out if anyone's interested. From these two familiar examples I can only assume that the myriad names Demetz drops in this and other genres are also worth investigating further. This is definitely one of those books in which you really want to dig through the bibliography. Also the detailed accounts of the political intrigues behind the governance of the 'Protectorate' by the Reich are very interesting. Demetz does an admirable job as an erstwhile biographer in his humane discussion of the lives of many of the German leaders in Prague at the time. Demetz unfortunately commits the cardinal sin of making many insinuations about future events to be covered later, the fates of various individuals, etc., without the followups he leads you to expect. Because of this the history he unravels begins to seem incomplete, speculative, and sloppy. This was a thoroughly enjoyable book. 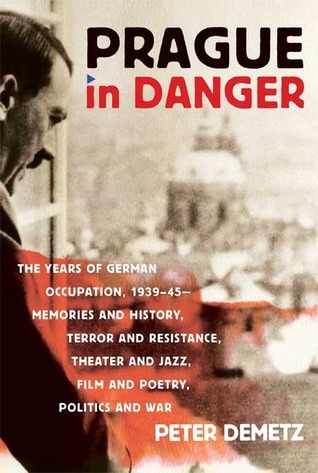 A superb combination of reviewing the cultural history of Prague under the German occupation. But also, personal stories from Peter Demetz that added a level of fascination I hadn’t expected. And, kept it from being a dull cultural history - but an excellent history book. While sometimes the name dropping of "famous" Czech figures is often a bit dense, the personal recollections mixed with the historical record is an interesting documentation of a life and country upended. I've been to Prague twice, and it still amazes me just how much the city was spared during the chaos of World War II. Demetz's book is an incredible story of what it was like to be there during the years of German occupation in the City of 1000 Spires. The author talks about his own experiences during occupation, his time in a small labor camp, the fate of several other Czech authors and poets, his friends and family, and at times the book elicits some truly emotional imagery. A must-read for an I've been to Prague twice, and it still amazes me just how much the city was spared during the chaos of World War II. Demetz's book is an incredible story of what it was like to be there during the years of German occupation in the City of 1000 Spires. The author talks about his own experiences during occupation, his time in a small labor camp, the fate of several other Czech authors and poets, his friends and family, and at times the book elicits some truly emotional imagery.